AzhwAr having enjoyed emperumAn (who is unlimitedly beautiful, being complete in all auspicious qualities) within his heart just like physically enjoying him, wanting to enjoy him physically, attempting for that, sees that it is not happening and becomes greatly distressed and starts speaking as some one else about his own situation. AzhwAr assuming the mood of a lover-girl who is of the nature of feeling joyful on union with bhagavAn and feeling distressed on separation from him, while in separation, starts seeing other entities and their activities and considers such entities too are suffering in separation from bhagavAn and tells such entities “You too are suffering like me”. In the first decad, AzhwAr mercifully starting to explain about bhagavAn‘s enjoyable nature, meditates upon his qualities which reveal that enjoyable nature such as sriya:pathithvam (being the master of srI mahAalakshmi), sEshasAyithvam (resting on Adhi sEsha), anishta nivarthakthvam (having the ability to eradicate unfavourable aspects), nivarththana parikaravathvam (having the tools for such eradication), sakthiyOgathvam (having the power), sathyavAdhithvam (being truthful), sambandha visEshavathvam (special/eternal relationship with all), kAruNikathvam (compassion), gamanIya vigraha yOgam (having bodily beauty which attracts all), kAraNathvam (being the cause of all). On meditating so, AzhwAr reveals the heart of a lover-girl who is in separation from her lover-boy (bhagavAn), who sees many entities and thinks that they too are suffering in separation from bhagavAn like herself and feels sorry for them too. 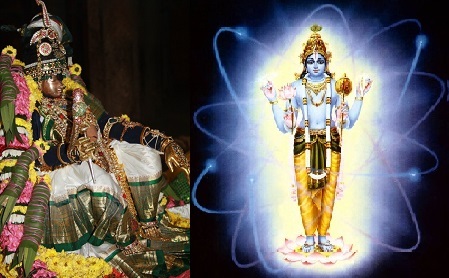 In previous decad, AzhwAr explained emperumAn‘s saulabhyam (easy approachability), mEnmai (supremacy) and vadivazhagu (bodily-beauty) in “maNiyai vAnavar kaNNAnaith thannathOr aNiyai“. Even one of these qualities is enough to become attracted and follow him – what to speak when all these three qualities are seen together? Desire to enjoy such aspects physically arises in AzhwAr. But since AzhwAr‘s desire did not get fulfilled, AzhwAr became distressed and in the mood of a consort of emperumAn who is in separation, goes to a garden to cheer herself. Seeing the activities of the objects in the garden, she understands those to be suffering in not uniting with emperumAn and sings about their suffering too. Even in thiruvAimozhi 1.4 “anjiRaiya madanArAy“, AzhwAr went through similar emotions. AzhwAr desired previous to that in thiruvAimozhi 1.3.10 “peru nilam kadantha nalladip pOthu ayarppilan alaRRuvan” (I will incessantly cry out to see the lotus feet which measured the worlds). At least in that case, he can console himself saying that the thrivikrama charithram happened in previous yugams and it is not possible to see the same. Here, “ugantharuLina nilangaL” (dhivya dhEsams) are present for the benefit of those who take birth subsequent to various incarnations (in previous yugams). AzhwAr is deeply distressed that his desire to unite with emperumAn in dhivya dhEsams as said in thiruvAimozhi 1.10.9 “nambiyaith thenkuRungudi ninRa” is not fructified. In “anjiRaiya madanArAy“, AzhwAr could hold himself up even to send messengers; Here, considering even such messengers are suffering in separation, he suffers for them too. AzhwAr‘s distress is deep due to his own nature too. Up until thiruvAimozhi 1.3 “paththudai adiyavarkku” decad, AzhwAr‘s distress is limited since he just experienced bhagavAn‘s nature and became separated. But from thiruvAimozhi 1.4 “anjiRaiya madanArAy” to now, AzhwAr deeply enjoyed his qualities and became separated – so his distress/sorrow is very deep now. The more we engage in bhagavath vishayam, the more tasteful it becomes. But, AzhwAr, not realizing that its natural for these entities to have such qualities, considers them be suffering in separation from bhagavAn, feels sorry for them as well. In this thiruvAimozhi, AzhwAr‘s distinction from iLaiyaperumAL (lakshmaNa) is highlighted. How so? lakshmaNa established that fish sustains itself in water. But AzhwAr feels that the fish, water and himself (everything) is sustained by bhagavAn‘s auspicious qualities. Just like when some one is in distress, they find others who are also in distress in the same matter, hug them and cry out with them to console themselves, parAnkusa nAyaki (AzhwAr) too, is seeing all the entities that are visible to her and cries out with them saying “we are going through same suffering”. Separation from bhagavAn is so difficult to handle even for animals, plants, etc., as stated in srI rAmAyaNam ayOdhyA kANdam 59.4 “…api vrukshA: parimlAnA:…” (Even the trees have dried up due to separation from srI rAma). As said in srI rAmAyaNam ayOdhyA kANdam 59.5 “upathapthOdhakA nadhya: palvalAni sarAmsi cha…” (even the rivers, ponds and streams became very hot and unapproachable due to the suffering in separation from srI rAma), water-bodies irrespective of being small or large, became unapproachable due their heat which was caused by separation from srI rAma. As stated in the same slOkam “parisushkapalAsAni vanAnyupavanAni cha“, even the forests and sub-forests became so hot due to anxiety out of separation from srI rAma. Like srI rAma did while in separation from sIthA as said in srI rAmAyaNam ayOdhyA kANdam 102.4 “sIthE mruthasthE svasura: pithrA hInOsi lakshmaNa” (Oh sIthA! your father-in-law passed away; Oh lakshmaNa! you have lost your father), AzhwAr too cries out for emperumAn [along with the objects he sees in the garden]. This entry was posted in thiruvAimozhi, thiruvAimozhi 2nd centum on November 11, 2015 by Sarathy Thothathri.